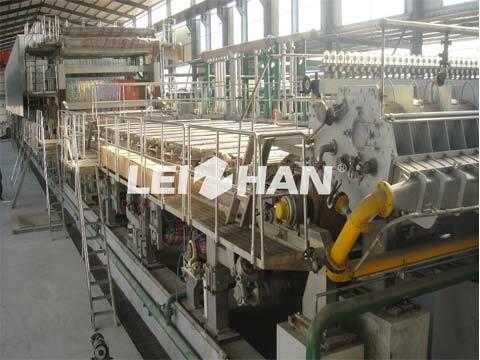 The wire paper width of Corrugated Paper Machine With Advanced Manufacture is 4600mm, which is mainly used for making low-basis and high-strength corrugated paper. 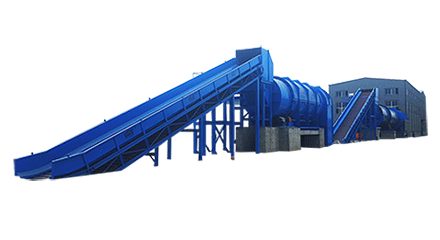 The Corrugated Paper Machine With Advanced Manufacture is mainly divided into the following parts: headbox, long wire section, press section, front drying section, diagonal row surface sizer, post-drying section, and coiling section. 1.Headbox: air-cushion headbox, controls and stabilizes the sizing head of the on-line slurry by controlling the gas pressure in the headbox. 2.Wire section: single long wire, main components contain chest roll, forming plate, dewatering plate, vacuum box, vacuum roll, drive roll, guide roll and frame. 3.Press section: includes first press, second press and third press. three of these stages are equipped with a guide roller and a blanket suction box. besides, their pressurize way are corrugated pneumatic tire. 4.Front drying section: 24 Φ1800 drying cylinders, 8+8+8 group transmission. with a semi-closed hood. 5.Diagonal row surface sizer: one chrome-plated metal roller and one rubber-coated metal roller. The surface size presser pressurize way is corrugated pneumatic tire. 6.Post-drying section: 12 Φ1800 drying cylinders, 6+6 group transmission. with a semi-closed hood. 7.Coiling section: pneumatic horizontal reeling machine. Transmission Mode: frequency conversion speed division drive.